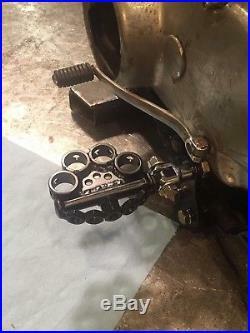 WISEGUYS CHOPPERS MID FOOT PEG MOUNTS WITH HARDWARE and HARLEY PEG MOUNT CLEVIS. And a set of our “Hard Knoxx” matte black powder coated pegs included. Ize in products and services around the Harley Sportster, and theYamaha XS650 motorcycles. We sell a large amount of stock and remanufactured parts for these models as well as provide various services for them both. 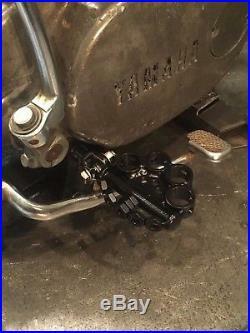 XS650 Mid mount plates with frame mounting hardware and a set of chrome Harley style foot peg clevis mounts. This set is made of 1/4 inch thick mild steel plasma cut to size and shape and milled holes for base mounting and upper peg mount. Grade 8 frame mounting bolts and lock washers included to secure the mid mounts to the frame lower tubes where the stock exhaust mounts. Compatible with stock mid controls, transmission shift lever, and rear brake lever assemblies. Replaces original stock side mount foot peg units from factory. This set also includes a set of Wiseguys matte black powder coated “Hard Knoxx” shop pegs and the chrome peg mount clevis’s for mounting are included in this kit. Mount plates are plasma cut, drilled, and then pressed to shape. I also have many other sets available with foot pegs we make in the shop in nickel or black powder coating finish. This sale is for the basic frame mounts, and bolt up hardware with chome peg clevis mounts, and a set of our nickel pegs shown in the pictures. I dont make or promote pogo stick style rod pegs for this model because I do not want to see anyone go into a corner tight and flip their bike over by hi-siding it on pegs that dont move. All pegs we make here at the shop are for Harley type clevis mount whether on our mids or forwards. Also please note that my shipper cannot deliver to a P. We need a street address for my shipper. Thank you for your understanding and attention to this matter. Buyers address if not a confirmed address. Thank you for your understanding in this matter. We wrap our s. E items to help insure they will get to you in good shape. If for any reason you feel that the s. Ways willing to work things out to make it a positive experience for you the customer. CHECK OUT OUR STORE FOR MORE. Be sure to check out our othe. R in store sales. For other great parts from this or other bikes, replacement, custom built, or other great stuff for your bike or hotrod. We like to build parts for custom bikes and rods. Also see our new services we provide for xs650’s such as swing arm stretch, swing arm under brace, powder coating engine and other parts, custom bike building, and hardtail frame modifications. The item “XS650 xs 650 Wiseguys bobber chopper cafe mid peg set black Hard Knoxx pegs” is in sale since Thursday, December 14, 2017. 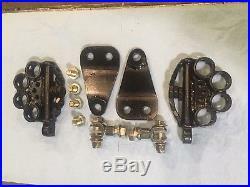 This item is in the category “eBay Motors\Parts & Accessories\Motorcycle Parts\Body & Frame\Other Body & Frame”. The seller is “joe-wiseguy” and is located in Stanwood, Washington. This item can be shipped to United States, Canada, United Kingdom, Denmark, Romania, Slovakia, Bulgaria, Czech republic, Finland, Hungary, Latvia, Lithuania, Malta, Estonia, Australia, Greece, Portugal, Cyprus, Slovenia, Japan, Sweden, South Korea, Indonesia, Taiwan, South africa, Thailand, Belgium, France, Hong Kong, Ireland, Netherlands, Poland, Spain, Italy, Germany, Austria, Mexico, New Zealand, Philippines, Singapore, Switzerland, Norway, Saudi arabia, United arab emirates, Qatar, Kuwait, Croatia, Malaysia, Brazil, Colombia.